Top quality Fight Gear made specifically with the MMA fighter in mind. 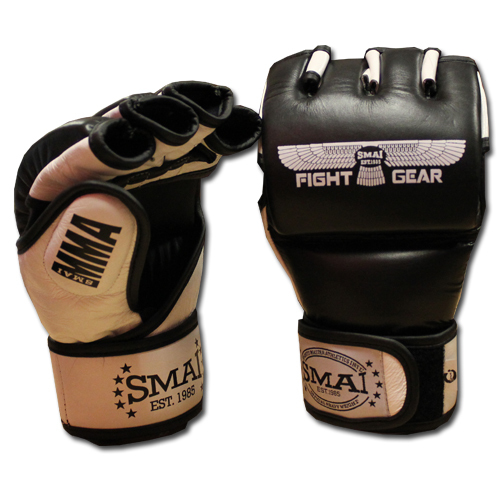 SMAI MMA velocity gloves are designed for ultimate grappling control - constructed from premium quality leather with Italian moulded foam for excellent hand and knuckle protection. MMA Velocity gloves are the key element to being the best fighter by bringing form and function to your training. Material: Premium Leather with Syntec Lining. Fit: Secure and long lasting Italian moulded foam inserts. Extras: locked stitching and Velcro closure strap â€“ created specifically for the champion fighter.